Projects at Studio CCLA are performed as a prime consultant to public, private and non-profit entities or as a consultant to a Landscape Architecture, Architecture, Engineering firm. 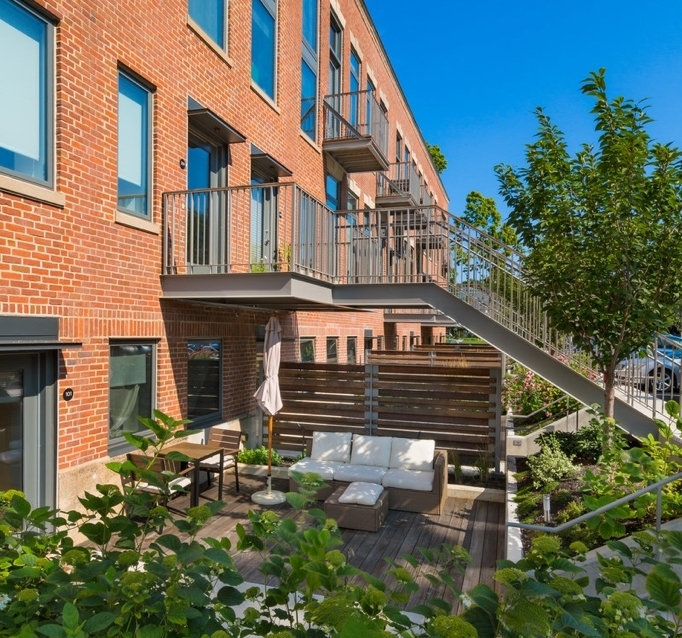 The development of The Wyeth located at 120 and 124 Rindge Avenue in Cambridge, MA is meets the requirements for certification for USGBC’s LEED for Housing at the Platinum level. The site includes an irrigation cistern, car charging stations and bike racks to contribute to the anticipated certification. The work includes overall site planning and design as well as courtyard design for individual units on the ground floor. Upon entering the site, the curved entry drive allows filtered views into the residential community from the street. A large front lawn is bordered by a garden planting that creates a serene space reflective of the site’s religious past while acting as a privacy buffer for neighbors. The old brick buildings have main entrances to access the second and third floor units on either end of the building. Plantings and custom wood screens create privacy between the courtyards and overall site circulation omitting the need for a railing along the narrow sidewalk. The wood screen with a low planter, and a wood deck are designed to soften the masonry building and create a private outdoor space for unit occupants. *Work completed while working at Crosby | Schlessinger | Smallridge. The development, spurred on by the construction of the Silver Line Rail connecting Washington DC to Dulles Airport, provides commercial housing, retail and office space for the resident who works and lives in Reston or the frequent flyer who needs consistant access to Washingtin DC. The work performed transitioned expansive parking lots that included a Chili’s Restaurant into a mixed use development which includes individual townhouse entries, a pool amenity area, an entry plaza, a retail plaza with in ground lighting, stage and trellis as amenities for the over 300 residential units at the VY. Extensive planting across the site, new sidewalks and easy highway access make this location highly sought after in the greater Washington DC area. *Work completed while working at OLIN. Tysons Central is an urban development located withe prime access to the new Silverline Metro in Tysons Corner, VA. OLIN provided design services for the master plan which included four parcels. Tysons Central is the second parcel proposed for construction. Due to the anticipated foot traffic on site the extensive plaza allows for flexible use and multiple scales of programming. Raised lawns with seating along the edge allows for sitting and playing. The turn around allows for future access to a proposed hotel use in parcel B. Pedestrian access is critical for the success of the space. Prioritizing the walkway by making cars slow down to traverse the raised walkway allow the pedestrian to traverse across the site seamlessly. Due to the massive grade change on the site an extensive staircase allow for a signature water wall and inside outside relationship between the dualing staircases. The design of the Harrison Garden began in 2016 when the Penn Museum contracted OLIN to review this outdoor space relative to the design of the car exit ramp from the underground parking garage associated with the New Patient Pavilion at University of Pennsylvania. The concept design was completed in September of 2016, schematic design submitted in January of 2017 and design documentation in the summer of 2018. The park area defines a critical third outdoor courtyard for public access to the Harrison Auditorium. The grade change allows for three amphitheater steps into the lower plaza that can be used for events associated with the Harrison Auditorium. The museums contents lends itself to interpretation in the park, notably, the tree selections are species from the countries whose artifacts are represented in the museum. Additionally, the materials for the low seat walls have a couple of options: 1) Proposed low seat walls which reference materials found in the museums collections 2) Proposed layered concrete walls to reference the mortar of the brick building and the layers of time. The stairway to the south allows for access to the future Hamilton Walk which connects to the SEPTA station. The space becomes a critical social hub for the Penn campus. Construction slated for 2022. The Department of Conservation and Recreation completed a master plan for the recreational reuse of the former Canton Airport. The master plan consists of an extensive trail system with boardwalks through the wetlands; wetland and riverfront overlooks; a canoe launch; a canopy walk; metal grated pathways along the riverfront to allow floodwaters to rise and fall without leaving contaminated sediment from up stream on the pathway; seating areas throughout; interpretive signage and a three acre park. The park provides a custom performance/shade pavilion; dry laid stone walls located in the footprints of former hangars; a sculpted lawn; overlook decks; an extensive interpretive plan referencing the diverse ecology of the site as well as the history of the airport; an entry pavilion and parking for trail and river use. The site work included close coordination with the architects to determine the locations of the penetrations to the skin of the building, and to define locations for both the interior/exterior and visual/physical connections for employees and visitors. Located on the Chesapeake Bay in South Baltimore, the location offers expansive views of the bay on an old industrial site. The design challenges: develop a plan for the full build-out of the site with a first phase budget of $3 million; maintain the current drainage systems; add a perimeter fence to secure the property; create “cutouts” in the parking areas to transform space designed for tractor-trailer trucks into pedestrian use. Currently the project is under construction. WRT Landscape Architecture worked in DesMoines for over a decade on the riverfront. The culmination of all of these years of work resulted in the contract to develop design guidelines for Principal Financial Group. I was the Project Landscape Architect for the project and led the completion of the master plan design of the core campus and wrote the design guidelines for the local landscape architects who ultimately developed construction documentation for the final build out.